You face a stark choice: prove I am again wrong, and risk my egocentric wrath. Or don't prove I'm wrong, and loose the 10 points on this problem. Do whichever you think best. Not the answer I wanted, but sadly I see no flaw in your argument. Student: congratulations you win this round. Haha! I love it! 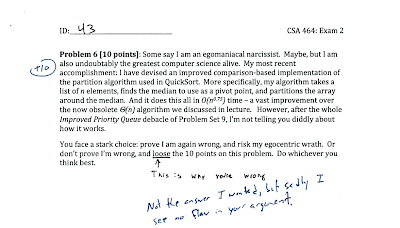 The student could have also chosen the "greatest computer science alive" line...I'm pretty sure it should be "scientist". I love these ones where students correct teachers, especially on simple spelling and grammar like this. Teachers should know better!